Yeah guess you're right. The back tail lights of the two models were similar if not identical. Isn't that a Chevy Biscayne? 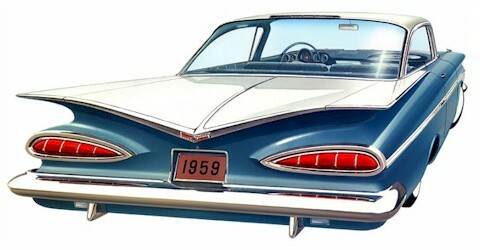 Gramps had this one in his driveway on Linden Blvd. ! Immortalized as "Ramon", a lowrider, in the Pixar movie "Cars". This was my first car! I bought it from my Aunt in 67 or 68 for $100. It was in perfect condition. Wish i still had it! My brother had one of these. We all loved it. Now that was style! I'll never forget the buzz going around at the time about how if you went too fast,(100 mph), the rear end would lift off the road because of the "fins". Never happened to us!